This position is part-time and 25 hours per week. Work schedule is flexible and can be negotiated with the Organization Director at start of position. 2. Promote Farm Bureau activities, member services, benefits etc during office hours. 6. Assist Organization Directors with preparing board packets and typing meeting minutes. 9. Attend special meetings or conferences that will aid in maintaining and improving the position of office administrator as directed by the ODs. 10. Perform other duties as assigned by ODs. Starting pay for this position is $11.00-$12.00 per hour. 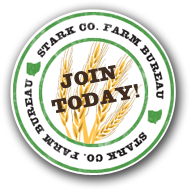 To apply, please send resume, cover letter, and 3 references to: Stark County Farm Bureau 1200 N. Main Street North Canton, OH 44720 or via email to: nkennedy@ofbf.org.